This easy recipe for oven-baked baby back ribs turns tedious fire pit cooking into a simple indoor technique that delivers fall-apart baby back ribs every time. If you don’t have an outdoor grill, or it’s the middle of winter and you just don’t want to uncover the grill and stand out in the rain, this recipe is a fantastic alternative that makes a really good rack of ribs indoors with very little mess and fuss. Barbecue is one of the true pleasures in life, but cooking low and slow over a fire pit for hours on end is not so pleasurable. I’ve actually never gone to the trouble to build a real barbecue pit. I rarely even cook ribs on the grill anymore. That’s because oven baking them leads to the perfect rack of ribs every time, with half the fuss. The key to giving these ribs intense flavor is in the dry rub. A perfectly balanced dry rub does wonders for the flavor, but also seals in the juices and keeps the ribs from drying out. 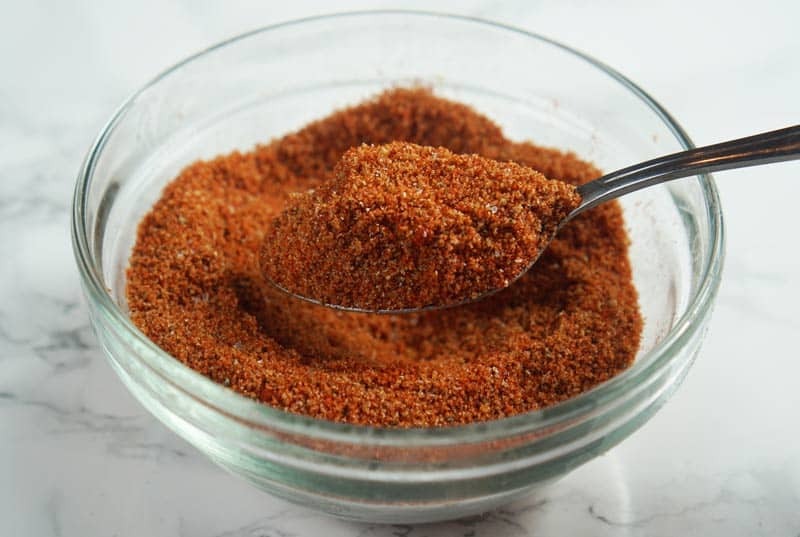 I swear by this bbq rib rub. It’s actually great on all types of meat, not just ribs. But I think it adds just the right amount of spice to the ribs. Baby back ribs in the oven are just about the easiest way to make ribs and still have that fall-apart goodness you love about ribs. I actually prefer baked baby back ribs to grilled now. The texture is just perfect. 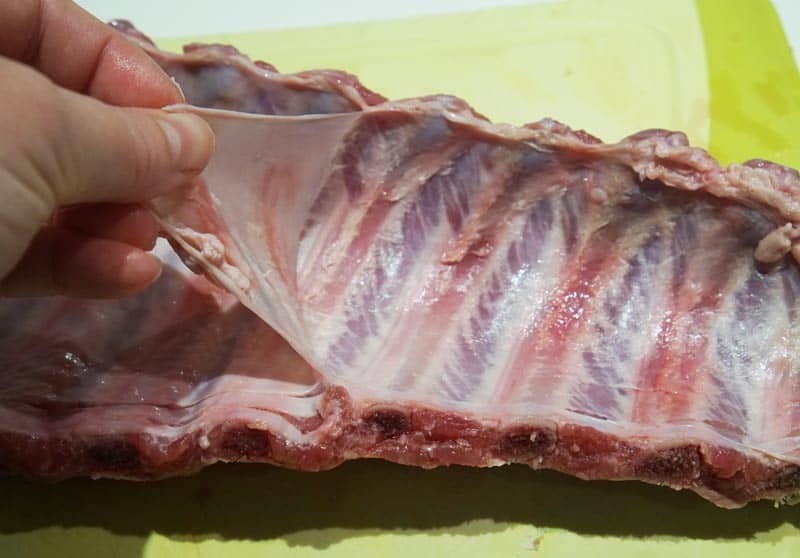 One thing you always have to remember about preparing ribs is that there’s a thin silver membrane along the back of the ribs that must be removed. The membrane is a thick skin that will prevent the ribs from actually falling off the bone. To remove it is easy. Just turn the ribs over and look for a piece of the membrane around the edges of the meat that you can grab hold of. It’s silver in color, or you’ll know what to look for. When you catch a piece, pull it back, like peeling a piece of tape off. If you get it just right, you can pull the entire membrane off in one piece. Here’s a pictorial to help. Next, shake the rub across the ribs and rub it all over. You can let it sit overnight in the refrigerator with the rub for even more flavor, but it’s not necessary. Cut off a piece of tin foil that’s large enough to make a pocket for the ribs. They need to be completely encased in the foil. Crimp the edges together to keep the steam in. This is how the ribs become so tender. Place the baking sheet in the oven at 275F. It’s a bit of a set it and forget it exercise. It’ll be in the oven for about two hours. After that time, give it a peek. The meat should have significantly pulled back from the edges of the bones. If you’re not sure if it’s done, insert a fork into the meat and give it a gentle tug. It should give easily. Be careful not to over do it. It’s harder to pick up the bones to eat when it’s too tender. When done, remove the ribs from the tin foil and discard the juices. 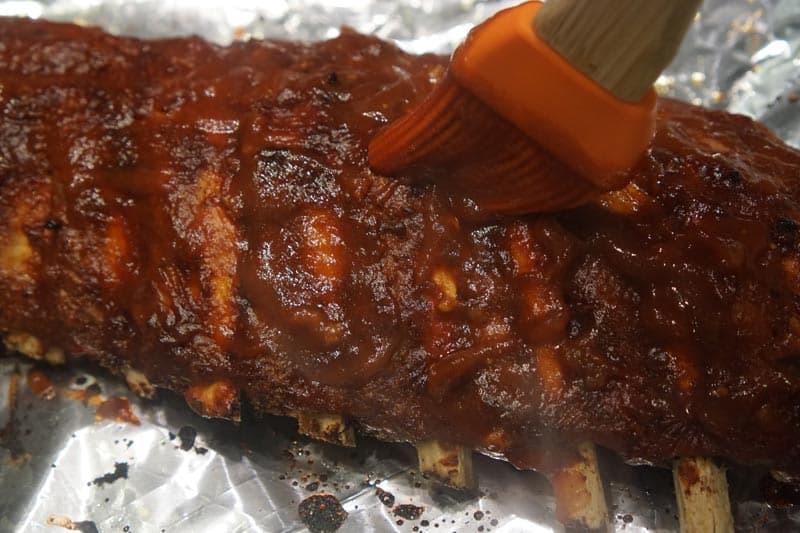 Slather up the ribs with BBQ sauce (be sure to check out our recipe for homemade Bourbon BBQ sauce – it’s to die for!). Place the ribs under the broiler for 3-5 minutes. Keep an eye on it in case of flare ups. I like to give them a second dose of sauce and put them back under the broiler for another 3-5 minutes, to fully caramelize the sauce. If you’re in a hurry, the second time isn’t necessary. The ribs will come out slight char on the sauce that makes them feel more like they’ve been on the grill. This adds to the intensity of the flavors. The best part about this recipe is that it’s incredibly scale-able. You can make one rack for one or two people, or even make 4 or 5 at a time to feed a crowd. 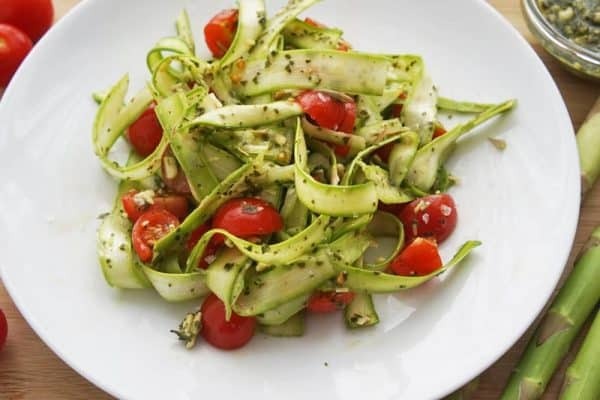 This recipe can also be used with spare ribs. You’ll just need to extend the baking time by 30-60 minutes depending on the size of the ribs. 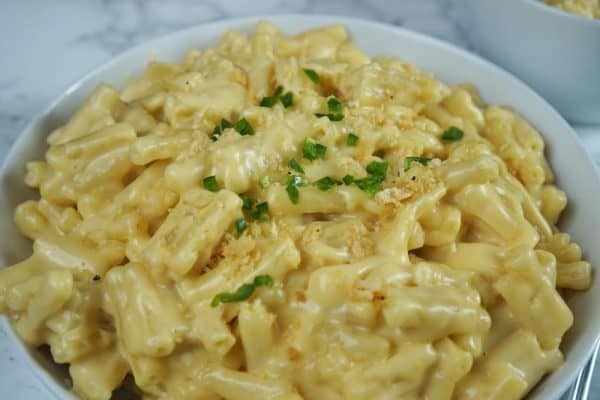 Like this recipes? Be sure to save it on your Pinterest board for later! Oven baked baby back ribs are fall-off-the-bone tender and flavorful, just like grilled ribs, but with a lot less effort. 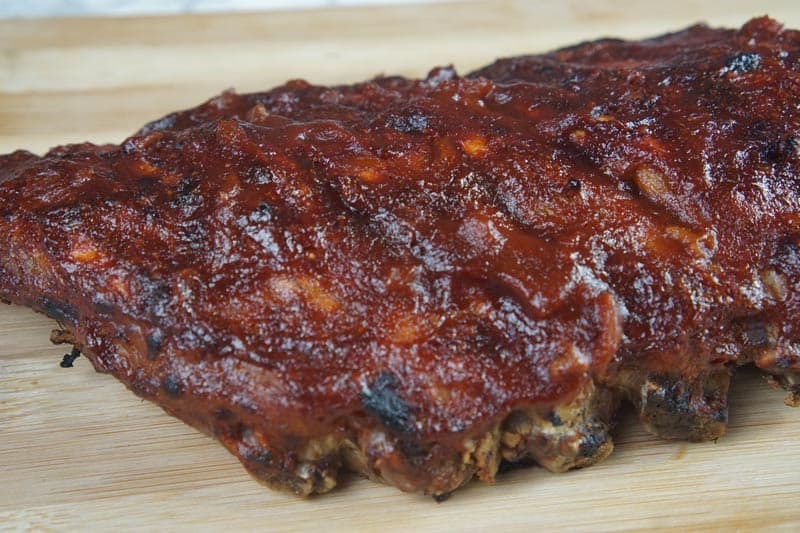 Rinse and pat the ribs dry with a paper towel. Remove the silver skin membrane. Coat the ribs in dry rub. 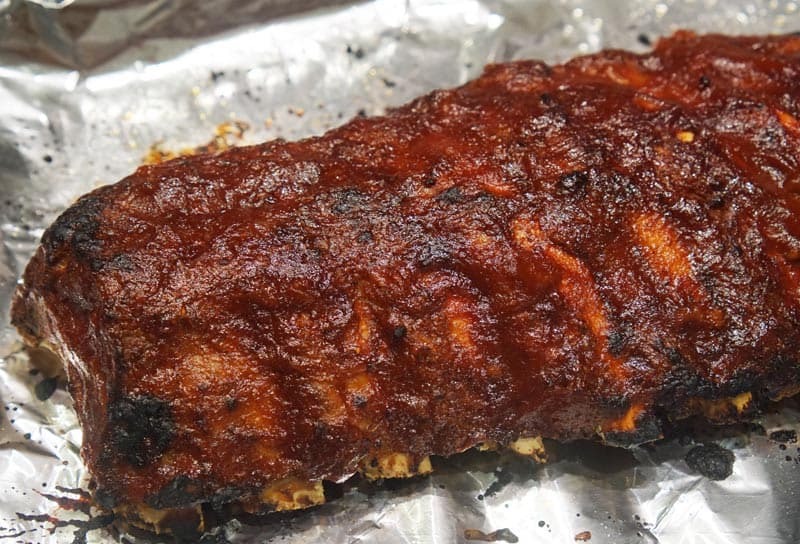 Wrap the ribs in foil on a baking sheet, being sure to seal the edges tightly. Cook for 2 hours. You’ll know it’s ready when the meat begins to pull back from the bone. Remove the ribs from the foil and coat with bbq sauce. Place the ribs directly on the baking tray and broil for 3-5 minutes. Repeat if desired.